Parkhill – The renaissance of the Sheffield’s ‘Little Mesters’ – Sheffield Urban CX 2018 – Entries Live! Parkhill flats will be the second stop in the Sheffield Urban CX series. This iconic Sheffield landmark has English Heritage listed building status due to its construction and also the fact that it is one of the first examples of ‘Cities in the sky’ social housing models in Europe. The Sheffield Urban CX series will highlight not only how cycling and the Outdoors Industry is playing a major role in the new chapter of Sheffield’s industrial story but also give the opportunity for some of the city’s iconic sites to tell their story. 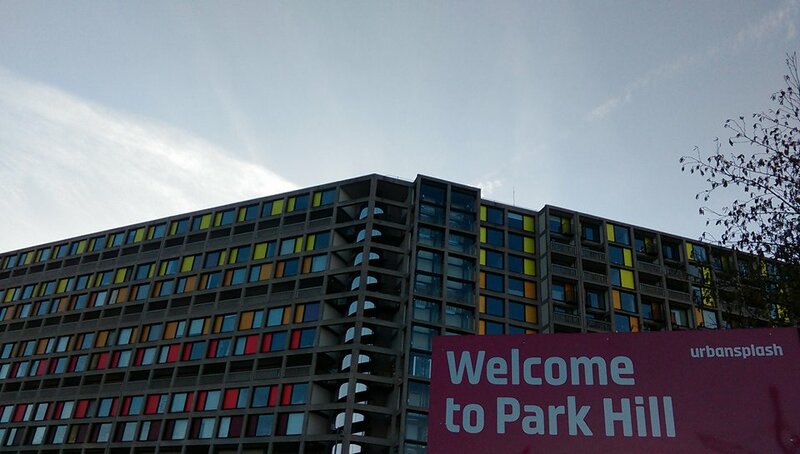 When we were on site in February 2017 for a photoshoot for the Sheffield Urban CX series the vibrant coloured panels that clad the newly re-visioned flats stand out proudly on the skyline of the city as we ride up from the station. The next block in the regeneration phase patiently waits its transformation like a slumbering giant. This contrast is one of the exciting things about this venue and we tested some course layouts during the photoshoot that weave between old and new. Edgy and exciting best describes the Parkhill round. We had help on the shoot from Richard Baybutt and Will Swinden from Sheffield Cycle company, Cotic and Dave McCleavy from Curbar Cycling, a new Sheffield cycle clothing brand. Sheffield is currently experiencing a regenerative process that is more sympathetic than the brutal destroy and rebuild approach of past decades. The kelham Island area once boomed with the sound of tilt hammers and melting furnaces, the structures that contained these industries were built to last and many are been re-purposed and redeveloped to house not only residents but also small independent businesses. 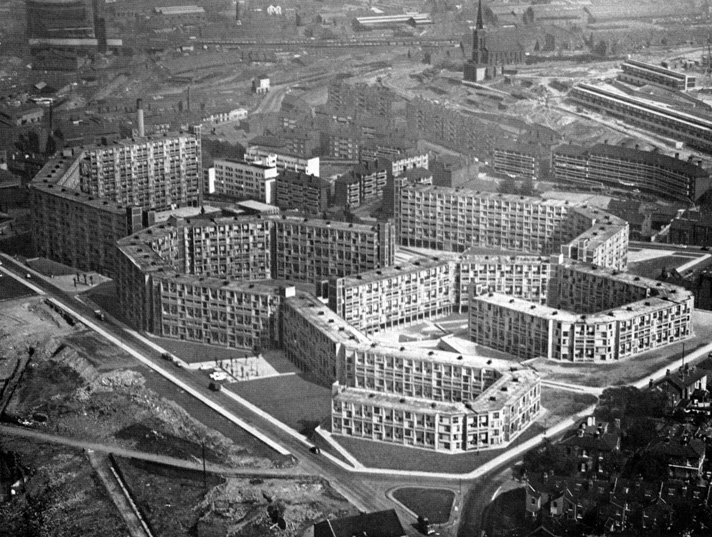 Parkhill flats would have housed workers in Sheffield’s heavy industries, and the community spirit that existed in the tenements, that were demolished to make way for Parkhill Flats was one of the elements the new development aspired to retain. To maintain a strong sense of community, neighbours were re-homed next door to each other and old street names from the area were re-used (e.g. Gilbert Row, Long Henry Row). Cobbles from the terraced streets can be seen today, surrounding the flats and paving the pathways down the hill to Sheffield station and tramlines. Eventually Parkhill declined, the fabric of the building decayed as did the social cohesion that was a focal point during Parkhills inception. 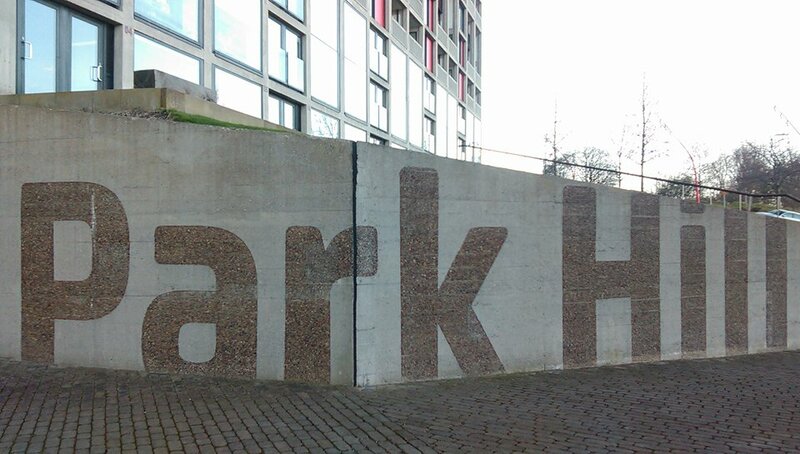 Urban Splash have been redeveloping Parkhill Flats for the 21st century. The site is rich in history and the stories of its past residents still echo around the blocks. The new blocks are now seeing a new community develop, residential and innovative businesses. In 2009 developer Urban Splash in partnership with English Heritage started a programme of regeneration to turn the flats into apartments, business units and social housing, this is now underway. The first phase was open to residents in 2010/11, and in October 2016 it was announced that the full renovation would be ready in 2022. The first phase of the regeneration has been completed and the redeveloped flats buzz with light and also the aspirations and stories of the new generation of residents. The new business and office spaces also buzz with the ideas and drive from the city’s new and more established creative and service industry providers, including one of Sheffield’s longstanding creative giants, Warp Films. The layout of the office spaces and also the eclectic mix of services on offer reflects the ethos of Sheffield’s ‘Little Mesters’, a collective of small workshops all working together to ensure Sheffield’s name was synonymous with quality and innovation in the steel and cutlery industry. Now the end product may be different but the collective output is still one that as a city Sheffield is becoming renowned for in the new digital age.